"Wildfire evacuation decision-making is challenging because the incident commanders need to take into account fire progression, population distribution and evacuation traffic," explained Dapeng Li, an assistant professor in the Department of Geography at South Dakota State University. Li's research uses data-based models to help emergency managers make those decisions. Specifically, he uses fire spread modeling to predict how fast the fire will travel and employs traffic simulation model to estimate how much time the people need to evacuate to safe places. "It's the coupling of the two models that helps us develop a better understanding of the dynamics and mechanisms behind the evacuation process. It's more complex than we thought," Li said. The wildfire evacuation modeling research was part of Li's doctoral work at the University of Utah. His results are published in a special issue on fire evacuation modeling in Fire Technology. 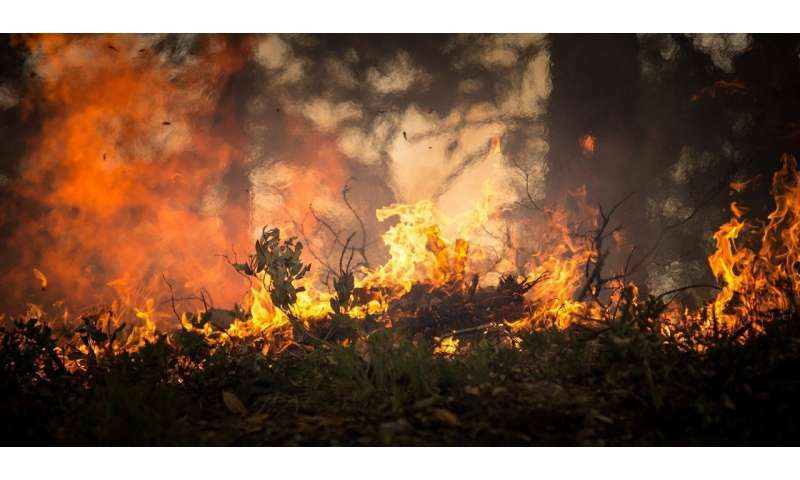 With the number of wildfires increasing and more people building homes in forested areas, recent wildfires have caused significant losses of life and property, Li explained. For example, the Tubbs Fire in northern California destroyed more than 5,000 structures and caused 22 deaths in October 2017. In July 2018, more than 1,600 structures were lost and seven people died in the Carr Fire in California. Warning triggers in environmental hazards take into account the natural, human and built environments and can be considered as an evacuation warning and timing mechanism, Li explained. To account for this, Li couples wildfire spread and traffic simulation models to set wildfire evacuation triggers. "The first step is to model the progression of the fire in the landscape", he explained, "We need to take into account factors such as topography, fuel type, fuel moisture, wind direction and speed. We can use fire spread modeling to derive fire spread rates at different locations in the landscape and compute fire travel times." To run the traffic simulation model, Li used house locations from the City of San Diego's Geographic Information System Department and the vehicle-occupancy data from the American Community Survey. "We need to estimate how many cars will be in the road network during the evacuation," he said. "If it is too congested, the evacuees could be trapped en route by the fire and die in their cars." Li used Julian, a residential area east of San Diego in the case study. The area has three communities and three highways, with approximately 1,500 people living there. However, he noted, the integrated model can be applied to any geographic area in the United States because the coupled model is based on open source software and open data. Coupling fire spread and traffic simulation models helps answer questions concerning the timing of warnings during evacuation, Li explained. Through the coupled model, incident commanders are able to simultaneously examine the spatial patterns of fire perimeters and evacuation traffic for every minute in the evacuation simulation. This could help them improve their situational awareness and issue more effective protective action recommendations. "My work is directly related to public safety—it's about survival. However, very few scholars are doing this type of research in the United States due to its interdisciplinary nature," Li explained, "There are still many problems that remain to be solved in this field." In the future, Li would like to further investigate how to incorporate more human evacuation behaviors into wildfire evacuation modeling and integrate the models into one software system. "This will make it more convenient for incident commanders and their technical support team to use," he added.